1998-2008 VW radios with CD-changer control. No need for sound-degrading Fm modulator tapes or FM transmitters. Connects to factory VW 12-pin CD connection in left rear of trunk. 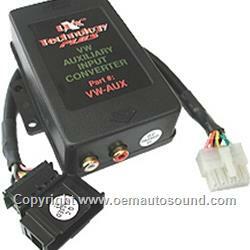 Volkswagen Aux input for vehicles that are pre-wire for CD-changer. If the vehicle is not pre-wire, or if you like to plug the aux interface directly to the VW radio use the VWR-AUX for small radios 7 x 2 connecting your aux interface behind the Volkswagen Radio will give you better sound quality. If you have a big Volkswagen radio 4 x 7 use the VW02-AUX auxiliary interface.